pennsylvania railroad co. : asbury park surf-bathing, 1905. Pennsylvania Railroad Co.: Surf-bathing at Asbury Park, NJ,, 1905. 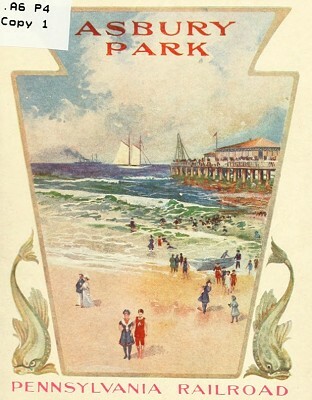 Asbury Park; a presentation of its attractions as a seashore resort. Pennsylvania Railroad Company, New York, 1905. 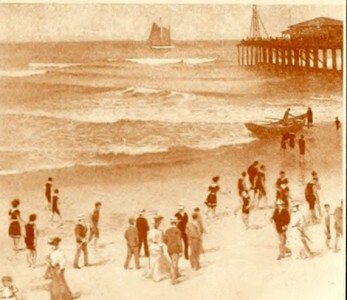 One photograph of surf-bathing at Asbury Park, including a surf-boat; the template for the coloured illustration on the cover (below). AT Asbury Park one finds a charming blending of the sylvan and the marine. It is a park on the brink of the sea. The wooded highlands of New Jersey and the ocean's restless waves almost meet across the narrow strand. Those accustomed to the noontide glare at some seaside resorts will appreciate the grateful shade these trees afford during the summer season. It is a unique feature. Were it not for the sound of the breakers, the visitor could well imagine himself many miles from the ocean, so like a prosperous inland town is this Sylvan City by the Sea. The bathing is remarkably good. Asbury Park with perfect safety, and thousands enjoy the exhilaration of this sport every year. For those who do not care for the surf bathing, there are several pools where they may get all the tonic benefit of the sea water without the excitement of fighting the waves. Geoff Cater (2017) : Pennsylvania Railroad Co.: Surf-bathing at Asbury Park, NJ, 1905.